Well, here we are, another fishing season staring us in the face after what seems like only about a half-hour break since last year. There’s a certain simple pleasure that comes from getting the reel re-strung and charging up the boat batteries in anticipation of another fishing opener in the Northland. Still with all of the routine rigging and making ready, there are some changes we’ll need to keep track of this year before we venture out to our favorite opening day fishing holes. Headline changes that brewed over the winter were the new slot limits for several Itasca Area lakes, Cormorants making it onto the radar screen and the Minnesota DNR committing to an extensive recovery program on Leech Lake. Here are a few thoughts about adjusting to some of the changes in store for us this season. Let’s start with the most obvious for those of us fishing in the Itasca Area this opener. Slot limits are growing in popularity around the state because at least in the short term, they appear to be having a positive impact on the lakes that have slot limit regulations already. Additional fish in the protected slot (17 to 26 inches) are mainly females and so as more of these breeding size females that remain in the lake, the potential for stronger spawning success also increases. With fishing pressure intensifying, folks are becoming a lot more interested in ways of protecting the brood stock. Slot limits are becoming popular among lakeshore owners who want to help find ways of spreading out the harvest of Walleye in their lakes. Whether it’s real or imagined is yet to be discovered, but it does seem like the “protected slots” on lakes like Winnibigosh and Rainy have given these lakes a boost. This year seven more Itasca Area lakes are added to the list. Jessie, Trout (near Coleraine), Round (near Squaw Lake), Splithand, Swan, Moose, Island (near Northome) and the Deer, Battle, Pickerel Chain (Effie) will all have the 17-26 protected slot regulation. Anglers will be allowed 1 fish over 26” in possession which is the same slot limit regulation that we’ve had on Winnie for the past several years. Mixed blessings? Who knows for sure, but among other effects, the protected slot limits will require anglers to make a few changes in the way we fish. Early season fishing is generally unaffected because large numbers of the smaller male fish are still found in the shallows, near spawning areas and locations where baitfish are plentiful. These areas hold fish until the water warms and fish move to main lake cover. Most folks catch enough variety of sizes to get plenty of fish for a meal at this time of year. But as summer unfolds, larger fish gather on main lake bars and humps. Anglers who fish these structures often have difficulty finding smaller “eating size fish”. With the protected slots, it’s important to make adjustments and move away from locations where all of the fish seem to be too large. I know; I hate to leave too, especially when you’re catching fish. But if you’re after eaters, you’ll need to locate those schools of smaller males and they’re seldom in the same location as those larger “bar fish”. weed beds, sand flats and the lakes primary drop off areas will often hold numbers of the smaller males. Switching to these areas will help you get more eaters when you need them. Another early summer trick; Stick with jigs and minnows as long as possible, even in deep water. Smaller fish keep hitting the jig even after the larger females switch their preference to live bait rigging. With an excellent year class of Walleye in 2001, early season Walleye action is predicted to be good this year. For folks who like to do lots of live bait rigging and don’t want to switch, slight adjustments can make all the difference. For example, if you like Leeches and have always insisted on Jumbos or Magnums, try switching to smaller leeches during these peak times. Large bait is attractive, but sometimes it can be too effective at encouraging the larger females and keeping smaller male fish away. Live bait riggers can also switch from using Leeches or Night Cralwers to using minnows instead. Larger minnows hooked lightly in the lips like Rainbows, Creek Chubs or even Suckers will get you into a variety of fish during summer and sometimes a mixed bag comes in real handy when you want the family fish fry at the end of your trip. Being adaptable will usually help swing the odds back in your favor and most days there’s plenty of fish for a fry if you remember to make an extra move or two to find that school of 15 inchers. Another under appreciated solution to the fish fry problem is getting into the habit of taking some of the smaller sized Northern Pike and making a meal out of them. These little Pike are so plentiful in our area that we can’t really make a dent in their numbers. They live fast, eat fast and die fast. Most of these fish will die before they ever reach 25 inches in length and I consider it my duty to try and find ways to utilize a portion of them each season. This is a wonderful way to get kids interested in fishing too and they’ll be willing to spend a lot more time in your boat when they’re catching something. What could be better than watching your kid take a run at a bunch of these scrappy and willing fish? Check my web site www.jeffsundin.com for some great free pike recipes, details about cleaning them and instructions for removing the Y-bones. Believe me when I tell you that you are missing out on some great eating if you pass up on these small Pike. and without doing damage. Good tools and a few attitude adjustments will really help. I insist on having a nice set of clamps like the kind you’ll find from Gemini (G2) in Grand Rapids or the real medical “curved Kelly type clamps”. These or any other clamps you use need to be fresh and strong. Clamps that slip off the hook will do more damage and put you at risk of killing a protected fish. Get rid of the needle nose pliers, they’re too big and bulky to do the delicate work of gripping the hook by the bend and rotating back out of the fishes throat. Avoid over feeding live bait to the fish. Lots of folks feed out tons of line because they want to be sure not to miss a fish. These days it’s a good idea to try and shorten the time fish are allowed to swallow the bait. If the fish is hooked in the mouth, there’s a lot better chance of releasing it healthy and unharmed. Circle hooks are helpful too because the exaggerated bend in the hooks shank encourages the hook to slip out of the throat and catch on the side of the mouth. When using the circle hooks, avoid using hard hook sets and let the hook do all the work. Another important new regulation for 2005 concerns the effort to bring about a recovery of the Walleye fishery on Leech Lake. At the heart of the issue are the lakes over population of Cormorants, which appear to have literally eaten up most of the lakes small, newly hatched Walleye for the past seven seasons. 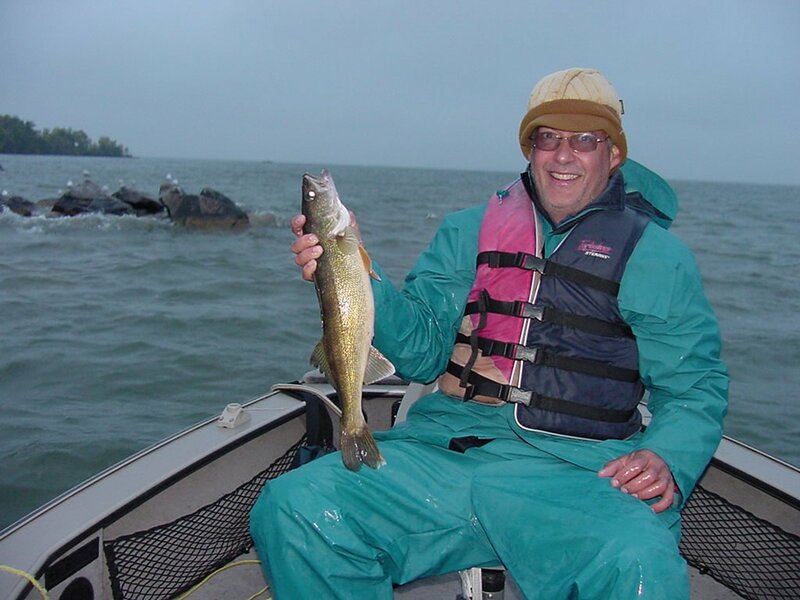 The larger Walleye, mainly between 20 and 26 inches are now largely the only fish left in the system except in Walker and Kabekona Bays where deep water has protected some of the smaller fish from the Cormorants. The protected slot limit is the last chance effort to protect the lakes remaining brood stock while the DNR works on solving the Cormorant problem. The remaining larger fish are the key to any Walleye recovery, so the new regulation is stringent and intended to almost completely halt the harvest of Walleye. Anglers will be required to release all Walleye between 18 and 28 inches. The bag limit is reduced to four fish, one of which can be over 28 inches. Walleye like these are the key to any hope of a recovery on Leech Lake. So for the time being, they all need to be released. Early season anglers best bet for smaller "keeper fish" is to stay in the deeper water of the West side bays like Walker, Kabekona and Agency, where the impact of the over-populated Cormorants has been somewhat less dramatic. If fishing results from the past few summers are any indication, the best bet for anglers looking for a fish fry on Leech Lake will be to concentrate all of your fishing efforts in Walker, Kabekona, Agency or Shingobee Bays. Think of these bays as separate lakes each with its own personality and layout. Thanks to the deeper water in these bays, smaller Walleye have been less vulnerable to the feeding Cormorants and there are still fish available for anglers. For folks who want to fish the main lake, switching over to Panfish, Bass or Northern Pike would be a good way to pass time during the anticipated recovery period. Bass fishing on the lake seems to be improving these days, with Bass are showing up in lots of new areas and so are Crappie and Bluegill. Fishing the heavier weed beds in Boy Bay, Waboose Bay and Near Battle Point are all good bets for folks looking for action and maybe a few fish for dinner? With all of the attention on Leech Lake’s Cormorants, this summer will be an excellent opportunity for those of us who are out on the lakes to provide a helping arm to the DNR. I plan on keeping an eye on areas where Cormorants appear to be nesting or on areas where they appear to live permanently. Keeping track of these resident populations and reporting them to our DNR will be essential in the coming years if we hope to get help with keeping some sort of reasonable balance between these hungry birds and the fish we all enjoy. Even with a few new regulations to keep in mind this year, the outlook is generally good. An early warm up turned on spawning fish. By opening morning we should be looking at Walleye groups already recovered from spawning and in a wide variety of locations. Fish populations have been strong in a good number of area lakes and the ice is gone. So what are we waiting for, let’s get outside and do some fishing.